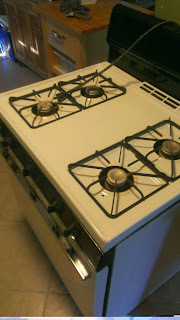 Last weekend we got a new stove. Why? Because in 2010 we were doing some heavy renovations that included ripping most of the sub floor out of the kitchen. This left us with a big hole that was open to the elements and inevitably, the wilderness made it inside, so we ended up with a rat living in our oven. We discovered the extent of the damage a few weeks later on thanksgiving, when we turned on the oven and were greeted with the smell of preheating rat pee. Yes, I did say 2010, which means that for three years, my husband and I have cooked every meal on the stovetop or in a toaster oven, including three Thanksgivings. Now to be fair, we are vegetarians, so it isn't as if we were cooking a whole turkey or anything, but looking back, it was quite an accomplishment. This, coupled with a conversation I had at work the other day made me realize how many modern convenience items, that everyone assumes are standard in all homes, we don't own. Are we strange? Or are there other people out there that get by without these things as well? Since somewhere around the mid 80s, I've always had a microwave. Heck, the last four apartments I've lived in had them included. But a few years ago, I learned that the urban legends about the dangers of microwaves were based in reality when ours decided to blow up and give me one heck of an electrical shock when I tried to unplug it. At that point we decided that radiation housed in flimsy metal and plastic was probably something we didn't want in our kitchen, so we never bought another one. The replacement: stove and toaster oven. Aside from greasy popcorn in a salty bag, there is virtually nothing that can't be made without a microwave. When my aforementioned coworker expressed disbelief in my ability to exist without one, I was genuinely surprised to find out that people actually rely on them for more than reheating leftovers (which can totally be done in a toaster oven or on a stove). I know it's the snobby thing to say, "I don't watch tv." But really, I don't. It's not that I'm too cultured and spend my time doing important things, I get plenty of lazy time with the internet and other distractions. It's just that I've never been a big fan of sitting on the couch and watching shows. When we did have a tv, I wasn't the one to turn it on. If it was on, I would occasionally sit down and suddenly realize that half my Sunday morning was gone and I had watched five episodes of Mythbusters (spoiler alert, C4 is always the answer to the age old question, "how can we make it explode?"). I can't get invested in series either because the last time I did that, I ended up wasting a huge portion of my life on the Battlestar Galactica reboot, eating crappy pizza and wondering how it was possible to make a tv show about robots in space so completely awful that I would rather watch a Pawn Stars marathon. The replacement: books, internet, writing, exercise, and generally, everything else. Sure, I don't get to participate in the office discussions about Dexter or The Walking Dead, but to be honest, I was never going to watch those shows anyway. At some point I may want to watch more of the new Dr. Who, but there's streaming video for that. 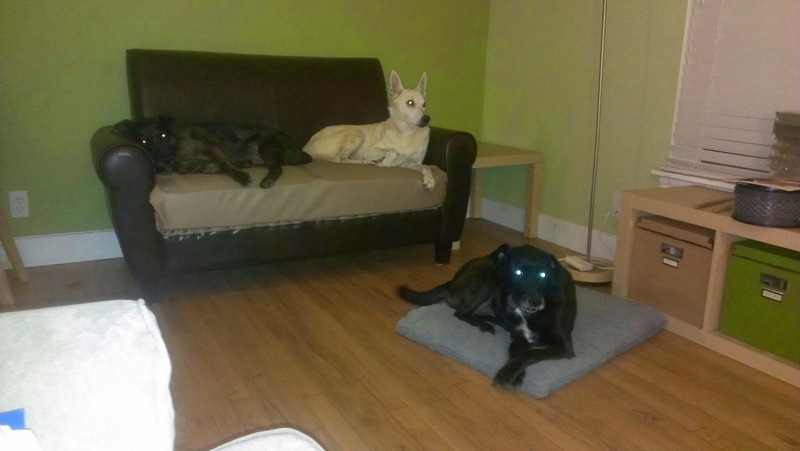 I'm not saying that we don't have a furnished home, but we do have three dogs with no concept of personal space, so we end up with things like this. There are two loveseat sized sofas in my livingroom. 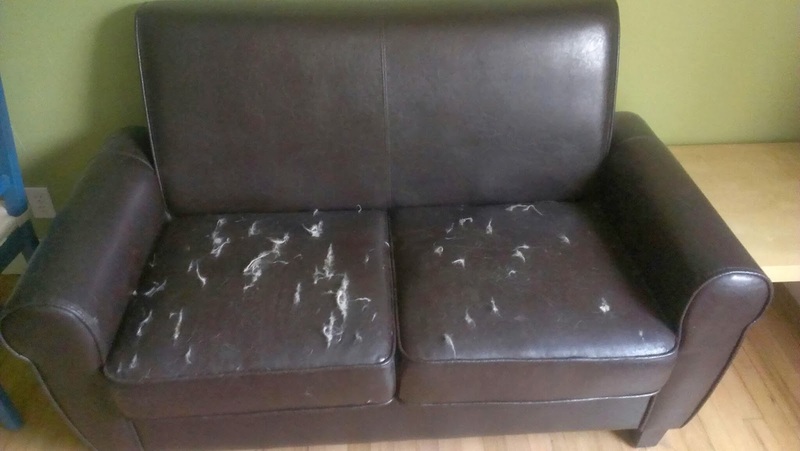 The one in the picture received a hackjob reupholster treatment from me, but make no mistake, that is the dog's sofa. The other is a quaint, mismatched Frankensofa that I cobbled together out of clearanced sectional pieces from World Market. When I'm not sitting on it, I have to cover it with books, my laptop, and a storage box to keep the dogs off. It makes entertaining difficult, but really, we never entertain, so it isn't an issue. The replacement: patio furniture. We live in a place with nearly ten months of reasonable weather so I spend a good deal of time hanging out on the patio while my crazy dogs run around the yard chasing squirrels. Not even the summer sun is a deterrent, but sadly, this year mosquitos were, so I've spent a lot of time on the sofa. It is a well documented fact that I have an incurable coffee addiction, so it may come as a surprise that I don't actually have a Mr. Coffee or a Keurig sorcery machine. To be honest, I used to have a little four cup coffee maker and all it succeeded in doing was make me spend money on coffee shop coffee. I hate the way drip coffee from a plastic machine tastes. The replacement: two French presses, a tea pot, two separate grinders for regular and decaf, and a stovetop espresso maker. Sure, it takes longer and makes a smaller amount of coffee, but if you have never had coffee from freshly ground beans in a French press, you haven't had coffee. Now of course, on the other end of the spectrum there are probably things we have an overabundance of. For me this is definitely electronics and for my husband it is probably drums. Does this make us weird? Are any of these items that you live without as well or are there other seemingly common things you live without?